Two ties. Never would have predicted it. But now UMD has to move on to their second Hockey East opponent in as many weeks, UMass Lowell. For the good, the games are at home which is unusual for this season's Bulldog team who have played four of their first five on the road. The RiverHawks present an unusual challenge for the Bulldogs. UMass Lowell is an unknown opponent who is a defensive juggernaut so far this season. Their competition arguably has not been upper echelon except for last weekend against Merrimack in a tie-fest just like UMD and Notre Dame. Whereas both Bulldog-Irish games were 3-3, both Merrimack-Lowell games were 1-1. In fact the RiverHawks have surrendered five goals in five games. 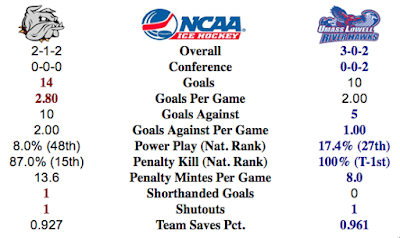 Conversely, UMass Lowell is having struggles on offense, though they don't need much with their defensive play so far. Unbeaten at 3-0-2, the RiverHawks have only scored 10 goals in five games. UMD can score, but can also be frustrating to watch on defense. It is no mystery that the Bulldogs will likely have to play two tight, full 60 minute games to pull off a sweep. Picks by @afiskness. It is the Halloween weekend and NCHC season starts for some of the teams beginning the race for the Spencer and Julie Penrose Memorial Cup. It will be a grind. I like that UMD has another weekend of non-conference play to get the scoring figured out before taking on NCHC foes. North Dakota @ Colorado College: The Tigers are bad and North Dakota is good, This will be a sweep by North Dakota. Miami @ St. Cloud State: Last weekend the Huskies were thumped out east by the Bobcats of Quinnpiac and the Redhawks split with the Saints of St. Lawrence. I think these teams match up well will be a split, unless Charlie Lindgren can find the touch again. Split. Nebraska Omaha @ Western Michigan: The Mavericks are the best team in the country right now, just a stick blade ahead of the Bobcats in my opinion, but playing their old CCHA rival at the Lawson Ice Arena is always tough. The slow down game of the Broncos will earn them a split. Denver @ Boston College and @ Boston University: The Pioneers take on two high ranked Hockey East teams in a pair of games that will likely have significant importance in the Pair Rankings come the end of the year. I like the Eagles to win at home on Friday, but the Pioneers to beat the Terriers on Saturday. Massachusetts Lowell @ Minnesota Duluth: Both teams are coming off a pair of ties last weekend and that is likely to happen again this weekend. But I will pick a split instead.